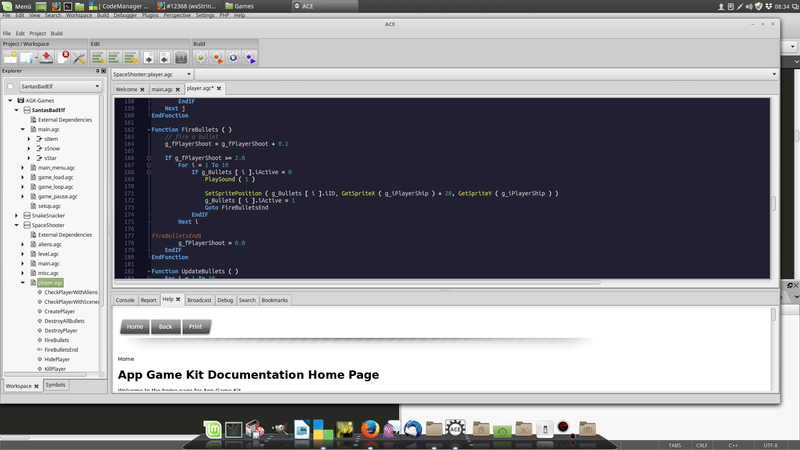 ACE is an alternative development environment to the official IDE of AGK. Clear representation of used symbols (function, labels, types variable, constants) in a tree view. Load and save of the complete workspace in which your projects organized. Intellisens of BuiltIn functions, user functions plugin functions and all other symbols in the current active project. Better line folding of types, functions and loops. Codesnippet functionality, similar to geany. Display help page, of the command by pressing F1. Code beautification at one click. Easy insertion of LIB/API modules. Paragraph, fold level and base fold level selection mode. Highlighting all occurances of selcted word in document. remembers the variable watch list of the last debug session. add variable to watch list per hotkey and right click. AGK-Core-Commands (All loops, ‘if … then’, ‘select … case’ ect. You can donate a few coins if you want. With a donation you enjoy neither benefits nor any other advantages. It’s just a appreciation of the work and to be regarded as motivation. If you’re a AGK-Plugin developer, you may also like to write a plugin definition file for your plugin. More information about Plugins see Modules/Plugin section.